With the First Annual U.S. F-Class Nationals running this weekend in North Carolina (Camp Butner), we thought you folks might like to see what the Big Dogs will be shooting -- in this case, one of the biggest dogs of all, Bob Crone, Vice-Captain of the U.S. F-Class Team (and inventor of the 6BRX). Bob will be shooting his ol' favorite, a rifle he calls "Dude". This gun has earned him a host of honors in F-Class competition, as you can see. It's chambered in 6.5-284 with a Nesika action, a 30" barrel, and special metal stock fixtures by Warner Tools. Bob will be shooting 142 SMKs this weekend, but his load is a bit of a trade secret, so you'll have to ask Bob yourself after the match. And Here's the VIP Edition. (That's One Heck of a Back-up Gun). Bob will bring a second gun to the match. 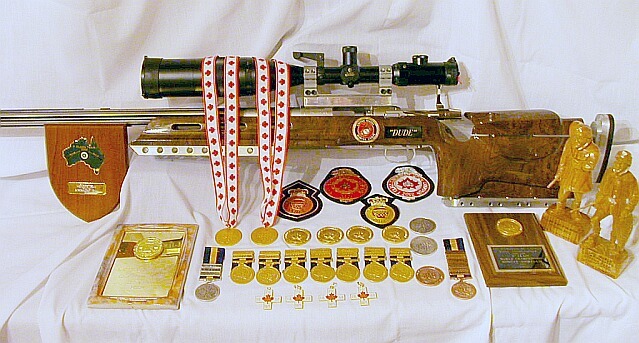 It is his latest and greatest F-classer--a special team gun, bearing the serial number: "US F-Class Rifle Team 01". Bob tells us "#01 will be used by Mr. John Sigler, the NRA's Second Vice President, who will attend the match Saturday and will shoot the Sunday 1,000 yard portion of our match." The stock looks like a single piece of high-grade walnut, but in fact it's laminated walnut, as strong as it is beautiful. The stock was crafted by Richard's Custom Rifles, who also chambered the barrel and pillar-bedded the action. Warner Tools again did the special metal-work. Bob Crone has four barrels for this gun. For the Nationals it will be sporting a 30-inch 1:8.5 twist from Broughton Rifle Barrels. The chamber was cut with a custom-made 6.5-284 Improved reamer--Clymer's slick new spiral-fluted model. Richard Franklin reports it delivers a very smooth cut. Interestingly, the chamber is set for a .2935" neck, so this gun can shoot unturned brass. Many top 6.5-284 marksmen like Bob have found that, with a properly-cut chamber, there is very little reduction of accuracy with unturned necks. Bob uses 142gr Sierra MatchKings. When sorted, he says they are as accurate and consistent as any projectile available. We were a little surprised to hear that Crone uses Hornady 6.5-284 brass. We know that most serious 6.5-284 shooters run Lapua or Norma brass, but obviously you can't argue with success. As you might expect, beneath the Nesika "K" action hangs a 2 oz. 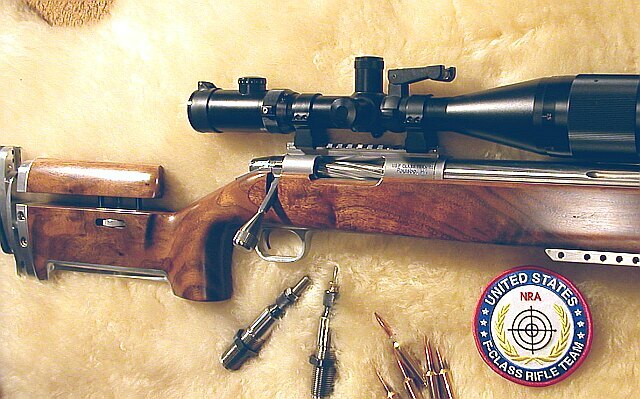 Jewell Benchrest trigger, and it's topped by a Nightforce 12-42x Benchrest Scope. Increasingly, this is the scope of choice among leading long-distance shooters. Crone believes the Nightforce is unsurpassed for light transmission and repeatability. This is a special event hosted by the North State Shooting Club (NSSC) in cooperation with the U.S F-Class Rifle Team. Prizes and custom made Gold, Silver & Bronze medals will be awarded to the top ten places and to daily winners. There are 67 medals total. We expect to award $10,000 or more worth of prizes. Winning teams will also receive special prizes and medals. Entries will be limited to the first 160 competitors and preregistration is required. There will be two classes recognized: F-Class Open with a 10kg (22 pound) weight limit and F/TR (F-Class/Target Rifle) with is restricted to .223 Rem and .308 Win caliber rifles fired off of bipods, with a 18.15 pound weight limit or 16 pounds if a front rest is used. A rear rest (sandbag or sock) is permitted if wanted. NRA rules will apply. Both classes will be receiving medals. Please see the NSSC website, Northstateshootingclub.com, or the U.S. F-Class Team website, USFClass.com, for more information.